British astronomers report the brightest black hole flare in recent years, as they observe red flashes erupting with the power of a thousand suns. The flashes of light, which lasted no more than a fraction of a second, were seen emitting from a black hole named V404 Cygni, 7,800 light-years from Earth. The jets of intense optical flare emitted by the black hole were very short in duration, approximately 10 times faster than the average human blink, but each had an immense power output. The impressive spectacle was captured in July 2015. Scientists have been studying the explosive eruptions ever since. 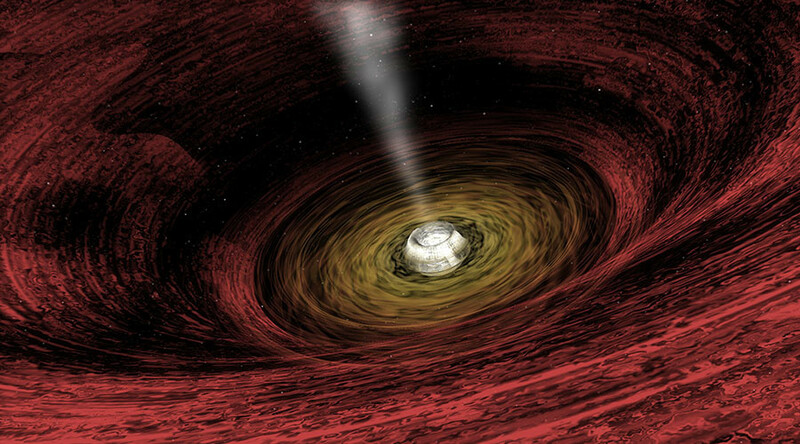 V404 Cygni was the first definite black hole to be identified in the galaxy and appears vividly when it is actively consuming surrounding material. Astronomers had been observing this particular black hole as it brightened dramatically while devouring an orbiting companion star. Material which could not be swallowed by the hole was consequently blasted out, creating the bright red flashes observed by a team of astronomers led by the University of Southampton. “These red flashes were found to be strongest at the peak of the black hole’s feeding frenzy,” said Dr Poshak Gandhi, lead author of the report. The observations published in the Monthly Notices of the Royal Astronomical Society are being used to develop a better understanding of extreme black hole phenomena. The intense light was captured using the Ultracam fast-imaging camera on the William Herschel Telescope in the Canary Islands.